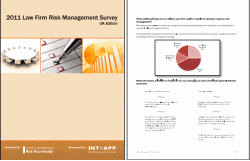 Sponsored by IntApp, the survey was produced by the Risk Roundtable Risk professionals from the 100 largest UK-based law firms were invited to participate. The Law Firm Risk Survey focuses on firm risk management policies, practices and priorities. It examines specific issues including, information risk management, confidentiality enforcement, and compliance tracking and verification. Top law firm risk concerns include confidentiality management, conflicts management and building a more risk-aware firm culture. 50% of firms have a dedicated risk management budget. Other firms draw funds from other departments' budgets. 75% of firms have a written risk register; most of these firms manage it manually using Excel spreadsheets. Nearly all firms have software in place to enforce information barriers. Most clients view risk management as a key priority or a way to differentiate themselves from their peers. Lawyers and staff view it primarily as a necessary but inconvenient pursuit. Clients are increasingly raising concerns about the steps firms take to ensure the confidentiality of sensitive business information. Most firms are concerned about at-risk lawyers who may be planning lateral departure, but only 35% of firms have any means of identifying these lawyers. 80% of firms perform internal audits to ensure policies are being followed. 40% of organisations can now provide audit trails and logs documenting compliance with confidentiality and information barrier requirements beyond the record of an initial screening memorandum.